As I have said before, I love cookies; but shortbread cookies are on my list of top five favorites. Unlike a traditional cookie, shortbread cookies are meant to be slightly crumbly (as opposed to soft). Shortbread is a Scottish biscuit traditionally made with one part sugar, two parts butter, three parts flour–and no eggs. Lots of things can be added to shortbread to alter the texture. More modern recipes may use a combination of both regular sugar and confectioners’ sugar, or exclusively confectioners’ sugar as in my recipe. For those who find baking challenging, these are about as easy as it gets–and you can adapt the recipe many ways. You can roll and slice shortbread cookies, like my slice-and-bake icebox holiday cookies, which I posted about in December. You can also make them in a large pan and cut them into squares or wedges. If you wish to go ultra-traditional, you can get earthenware molds for that classic shortbread look. 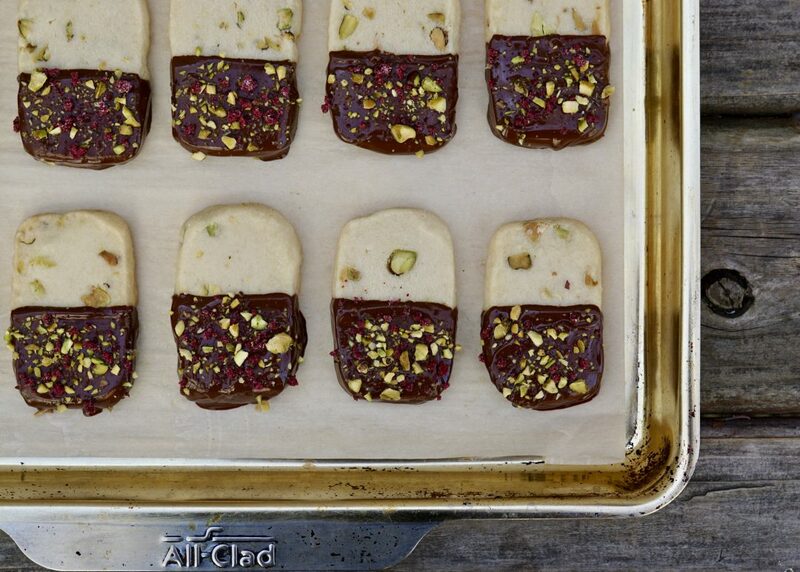 For mine, I treated them like a refrigerator cookie and made the dough into rectangular logs (rather than round ones) to keep with a more traditional shape. Historically, shortbread is believed to be derived from medieval biscuit bread made from leftover bread. Shortbread is widely associated with Christmas and Hogmanay (Scottish New Year) festivities in Scotland. Originally considered an expensive luxury food item (because of the high butter content), it typically was served only on special occasions and at celebrations. The most widely recognized commercialized brand is Walkers, which you can find just about anywhere. As I mentioned, shortbread is adaptable. 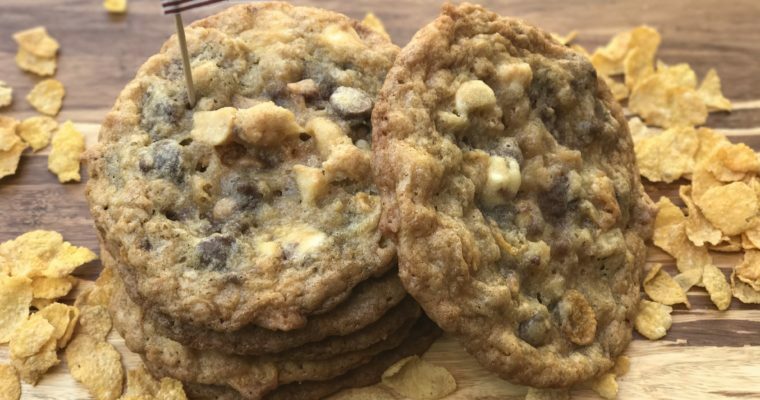 These days, chocolate chip shortbread has become a thing. Personally, I prefer my chocolate chips in a soft cookie. 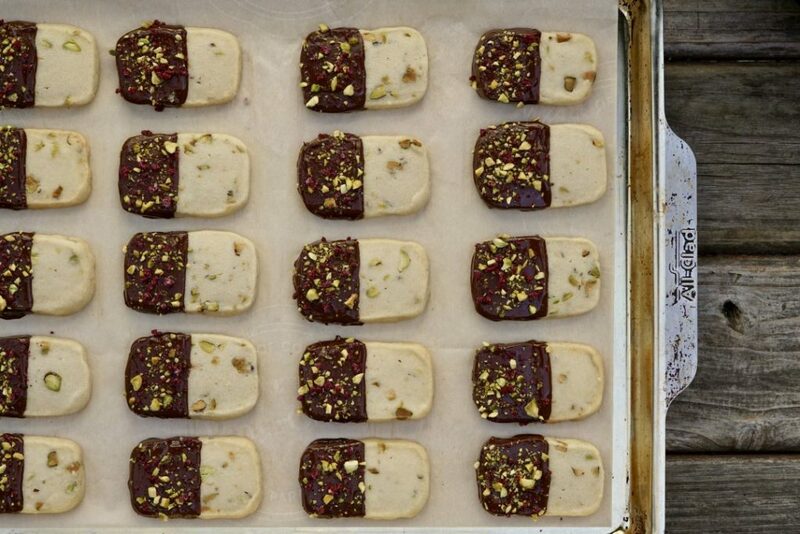 In this recipe, I add pistachios to the batter for more flavor and texture. 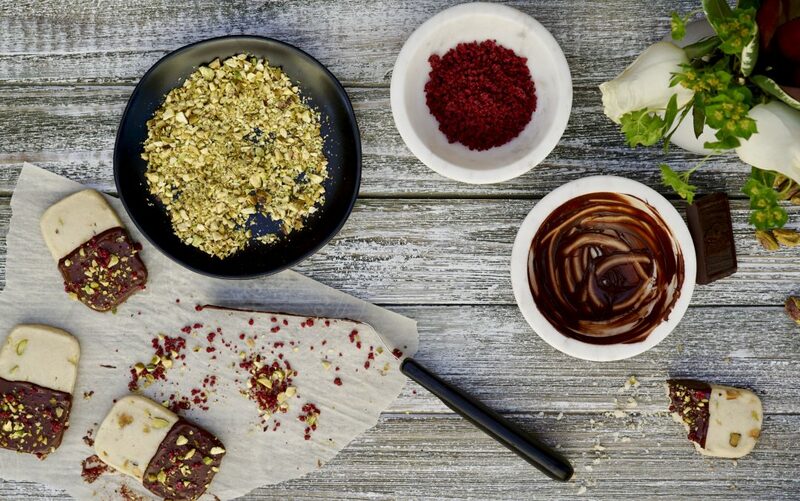 I also dip them in chocolate, sprinkle them with more chopped pistachios, and add a few sugared hibiscus flower crystals–a fun product I’ve been playing around with–to make them pop even more. 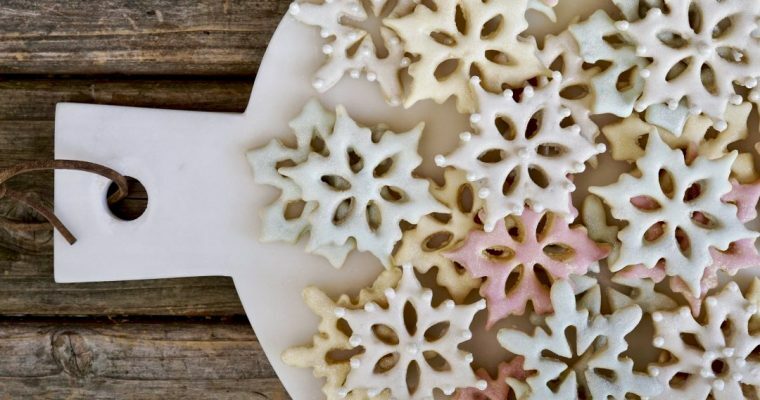 Although these are not Christmas holiday cookies, they sure would be lovely during holiday time so if you don’t try them now, file them away for later. My boys said these cookies were “very fancy and delicious,” a stamp of approval I will gladly accept. Step 1 Using a kitchen mixer, such as a Cusinart fitted with a paddle attachment, add the butter and powdered sugar and beat on medium until well incorporated. Add the vanilla and mix. Step 2 With the mixer on low, add the flour followed by 1/2 cup of roughly chopped pistachios. Mix well to incorporate. Step 3 Lay a long piece of parchment paper on a flat work surface. Place the shortbread dough on the parchment paper. Using your hands, form the dough into a log, about 14-inches long and 3-inches wide. Step 4 Fold the parchment up over the shortbread log so it is now completely covered by parchment paper. Using your hands, smooth and flatten the top of the log as best as possible. 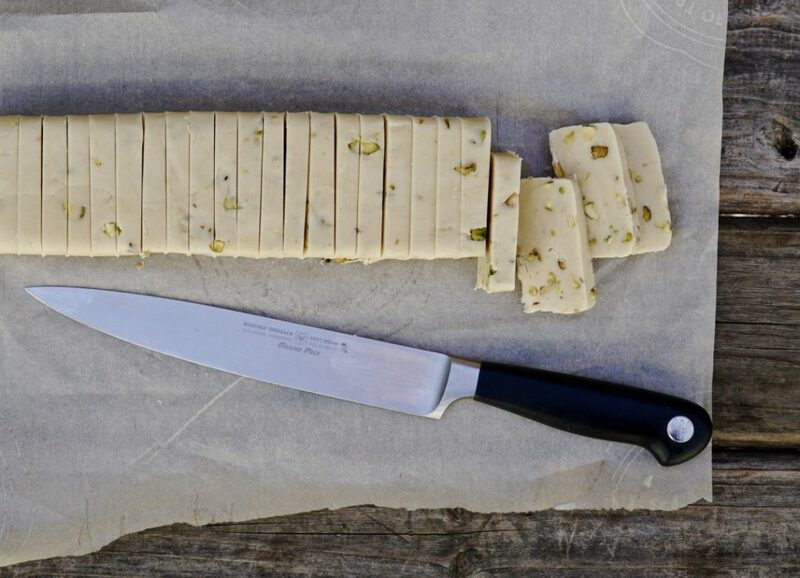 Gently rolling over the parchment paper with a rolling-pin sometimes helps achieve a smooth surface. Turn the log on its side and repeat the above to flatten as best as possible. Keep rotating and flattening until the log has a nice rectangular shape. Place in the refrigerator and let rest for 1 hour or more. Step 5 To finish the shortbread, preheat the oven to 300 degrees F. Line two baking sheets with parchment paper and set aside. Step 6 Using a sharp slicing knife, carefully slice the dough into 24 equal pieces. Evenly space the shortbread on the prepared baking sheets. Bake for 20 minutes until slightly brown on the edges, but soft to the touch. Remove from the oven and let cool completely. Step 7 Place the chocolate in a microwave safe bowl and melt until smooth. Dip one of the shortbread into the melted chocolate and place back on the baking sheet. 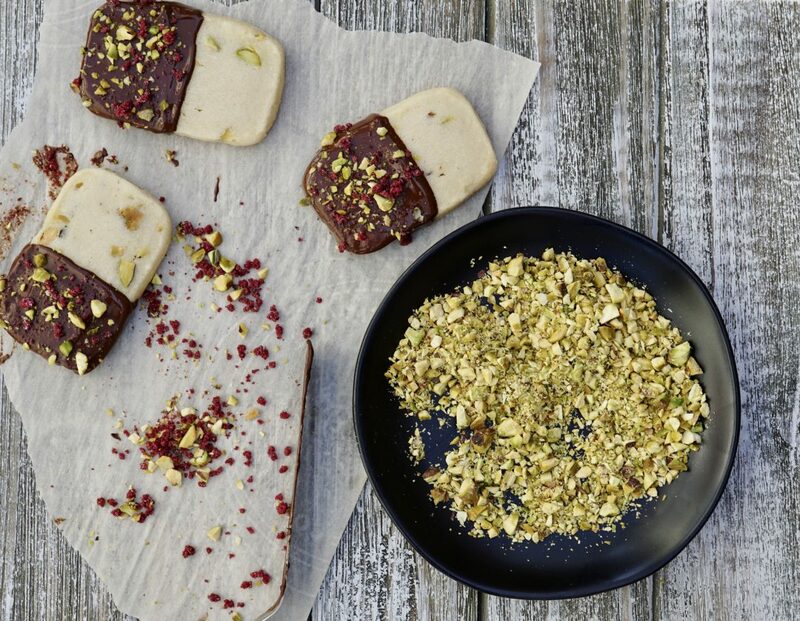 Sprinkle with finely chopped pistachios and some sugared Hibiscus flower crystals and allow to dry. Repeat with the remaining shortbreads. Store in an airtight container. I have just printed the recipe and added what I need to a grocery list! My kids are going to love them!